With many years of experience in providing the highest quality garden and landscaping equipment there is no need to look elsewhere for your crimping tool & sleeves/ferrules. Our crimping tools we supply here at SecureFix Direct are ideally used for crimping sleeves onto fencing wire and unlike many other versions this tool is built to a heavier standard. 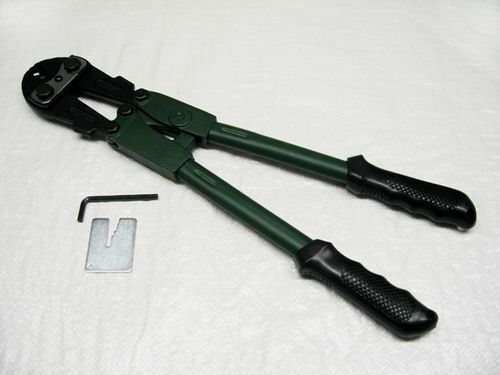 Our crimping tools are able to endure handling even the most heavy duty sleeves. This particular tool has four different cut outs with markings to indicate the appropriate sized sleeve to use with each cut out. 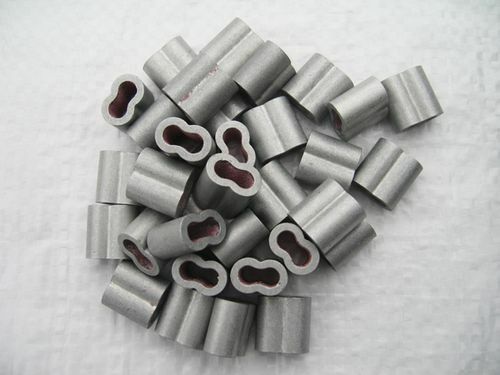 The crimping sleeves/ferrules we have at SecureFix Direct are all double barrel which make for a strong neat join with no danger of the wire crossing over itself within the sleeve. We recommend that the double barrel crimping sleeves should only be crimped using a cup to cup crimping tool. All of our crimping tool &sleeves/ferrules are highly durable and completely heavy duty, although neither can be used for wire rope, they can only be used with fencing wire. The crimping tool we provide here at SecureFix Direct comes with an Allen key, compression gauge and instructions for using the item so you can check that the crimp has been done correctly. Here at SecureFix Direct we take great pride when it comes to providing customers with high quality items at the most competitive prices and you can always find the best deals when you order from us. Not only that but we also offer a free and fast delivery. If you need any more information then please get in touch with a member of our friendly staff today.